Happy National Coloring Book Day, UEsiders! A most inclusive celebration… Honoring coloring books for kids, adults and teenagers!! Hey and assemble your own bouquet with Sikking’s gorgeous blooms! Last week’s recycling totals: 121 lbs. batteries; 17 lbs. cords, corks, cellphones and cartridges; 1 pair of eye glasses; 8 compost bins; 55 bags of clothes. Another 8 bin midsummer week! Wow!! The store opens at 11:30… The buying commences as the clock chimes 12:01 and continues to 2! A great local bookstore event! Happy reading, Potter fans!! At their tables will be American Seafood, Meredith’s Bakery and Bread Alone, Ole Mother Hubbert, Phillips, Norwich Meadows, Stannart and the Angel Family Farms! One more time: Melon alert! And tea drinker alert: Check out Angel Family’s lovely bouquets of camomile! Last week’s recycling totals: 9 lbs. batteries; 2 lbs. cords, corks, cellphones and cartridges; 2 compost bins! Yet another 2 bin week!! Sunday, July 31st: Summer Sizzle II on Pier 90! More music from the great Grupo Guateca!! More fabulous refreshments from generous folks of COFFEED! Last week, folks lingered, chatting under the canopy or sat looking out at the river for hours! Pure UES pleasure! Totally free! Come, get to know and show your support for the great people of Precinct 19! And while you’re getting acquainted enjoy the music (French Cookin’ Blues Band), face painting, board games, arts and crafts and refreshments courtesy of the Butterfield Market, Maz Mescal, Gotham Pizza and an (can’t not have one!) ice cream truck!! Need we say family friendly? Organized by the East 86th Street Association. And free! Wednesdays August 3rd, 10th & 17th : Uptown Bounce! Saturdays, August 6th, 13th & 20th: 2016 Summer Streets! Stating what’s been obvious for weeks: The MTA now admits Second Avenue Subway construction’s significantly behind schedule. So Waste Management – so deeply entangled in NYC’s waste management – has been accused by yet another state – Delaware – agency for committing recycling violations!! Gigantic YIKES!! New York is one of 16 states that has yet to submit its plan to reduce ozone pollution!! Congrats to East End Avenuers who – in the face of blocks of new construction – are organizing their own task force! An even deeper doff of the hat to great New Yorker (and inspiration to the ever expanding universe of East River Esplanade Friends) Elizabeth McQueen whose advocacy’s restored Long Island City’s Queensbridge Park. Whoa! Wal-Mart – assisted by no less than the Environmental Defense Fund – is now requesting suppliers remove 8 chemicals from their products. Here’s really hoping the Olympics isn’t a debacle… But, for the moment, authorities are poisoning Rio’s street cats! Just how hot is it on NYC’s subway platforms…? The science behind the famous Corpse Flower!! Pretty fantastic that the Waldorf’s kept an archive – and had an archivist on staff! – over the many years of its existence! May it not be lost!! Yes, there’s real, actual, scientifically verified human/bird communication/cooperation! Maybe making volunteering for the NYS DEC’s summer wild turkey survey all the more attractive!! Leave no trace. Remove all trash and recycle whenever possible. Disposing of fishing lines properly. Keep dogs on leashes and obey local laws regarding dogs. A Move-Me-Ever-Closer-To-The-Air-Conditioner, Hottest June on Record, UESiders! NYC’s on a roll with Air Quality Advisories as well! You will take care of yourself in this crazy weather, yes? Keep yourself, family and friends cool and hydrated? Same for pets? Even head for a City Cooling Center, if need be? Now: Corpse Flower in Bloom! At their tables will be American Seafood, Bread Alone, Ballard’s Honey, Valley Shepherd Creamery, Rising Sun Beef, Alewife, Ole Mother Hubbert, Cherry Lane, Samascott, Gajeski, Green Pastures and Sikking Farms! AND there’ll be music this Saturday, too!! Got to get there early if you want to score Green Pasture’s mushrooms and Samascott berries! Last week’s recycling totals: 112 lbs. batteries; 26 lbs. cords, corks, cellphones and cartridges; 8 compost bins; 41 bags of clothes. There couldn’t be a more graceful exit as Tekserve prepares to close its doors! For what the tech they’ll be taking… And be sure to thank them for being one great NYC tech recycling pioneer! This week featuring Special Guest Market Manager Angela and CORN! Save yourself for a great corn demo and The Gues-the-Number-of-Kernels-on-the-Cob Contest! The Prize: A Greenmarket tote filled with fabulous Greenmarket ingredients! And with us will be American Seafood, Meredith’s Bakery and Bread Alone, Ole Mother Hubbert, Phillips, Norwich Meadows, Stannart and the Angel Family Farms! Last week’s recycling totals: 15 lbs. batteries; 3 lbs. cords, corks, cellphones and cartridges; 2 compost bins! Sunday, July 24th: Summer Sizzle on Pier 90! As if the cool breezes and view weren’t enough, this Sunday there’s the fantastic music by Grupo Guateca and equally great refreshments courtesy of the people at COFFEED! Totally free! Wednesdays July 27th, August 3rd, 10th & 17th : Uptown Bounce! They may be of a different type, but NYS now has its own proliferating algal blooms! Yes, there’s Strand Bookstore test for new hires… Want to take it? Bloomingdale’s is now carrying a line of Alexander Hamilton brand clothes! Two opportunities to put those bits and pieces of leftover yarn to really great use… #1. For mariners around the world via the Christmas at Sea Program and #2. Creating dolls for special needs/disabled children through Feel Better Friends! Then there’re those ancient shell-shrouded creatures whose week this is … The cephalopods! Animal-lover site “The Dodo” has one conclusion as to why cats like knocking things over (especially if those things are above floor level: Because they’re cats. We have another: They’re citizen scientists studying gravity! A gang of raccoons is active up in Harlem! Happy Ninth Annual City of Water Day, UESiders! And the festival’s not just confined to New York… Hoboken’s participating, too! Meanwhile, there’s the (non-Water Day) Obscura Society tour of shipwrecks along the Coney Island Creek! Whatever one does, it’ll be a great July 16th!! Webster Library Branch, 1465 York Avenue at 78th Street, 3rd Floor, Friday, 10am-4:30pm, Saturday, 10am-12pm. Starmaster John Pazmino sheds light on that strange class of asteroids, the Trojans! Sure, Jupiter, Mars and Neptune have Trojans… And – as has been recently discovered – so does EARTH! Free and very much fun! With us will be American Seafood, Bread Alone, Ballard’s Honey, Valley Shepherd Creamery, Rising Sun Beef, Alewife, Ole Mother Hubbert, Cherry Lane, Samascott, Gajeski, Green Pastures and Sikking Farms! And while it will be Water Day elsewhere, it’s total Fresh-from-the-Field Corn Day at our UES markets!! Don’t miss Samascott’s berries either! Last week’s recycling totals: 104 lbs. batteries; 31 lbs. cords, corks, cellphones and cartridges; 1 pair of eye glasses; 8 compost bins; 37 bags of clothes. Was Council Member Council kohlrabi cold slaw fabulous or what? As ever, at their tables will be American Seafood, Meredith’s Bakery and Bread Alone, Ole Mother Hubbert, Phillips, Norwich Meadows and Stannart Farms! And a warm welcome to new-to-92nd Angel Family Farm (from which we last week purchased the biggest beets ever)! Last week’s recycling totals: 2 lbs. batteries; 2 lbs. cords, corks, cellphones and cartridges; 2 compost bins! For those who’ve had the – we mean it – sublime experience of being out on the East River in one of the Crew’s wonderful boats and want to be – how can you stop yourself – going again and this time bringing friends… For those of you who’ve never been and have been promising yourselves that treat… Give yourself the pleasure of knowing this most green and special pleasure of the UESide’s Esplanade and make sure it continues and expands! Suggested donation, $30. Yes! It can happen! Citizens’ will can prevail!! Case and point: 85-89 Jane Street!! For sure, we’ve got horsetrails in NYS Parks! Or wish to comment on the proliferating LinkNYC kiosks? The project’s way exceeded its Kickstarter funding plea (and rightfully so, it’s so clever)… The Periodic Table of NYC Trash! NYS DEC’s just introduced a NYS Fishing, Hunting & Wildlife Watching app! A whale census is underway in NY Harbor! Meanwhile, some NYC people and their aquariums! Don’t we all know NYC has turtles, but terrapins…? And the Bird of the Week is… The white-winged cotenga! A Most Unhappy Ninth Annual Invasive Species Awareness Week, UESiders! The good news being that NYState is being pretty darned aggressive in its approach, be the invader flora, fauna, visible to the naked eye or microscopic. Example: Boat owners are required to thoroughly clean their craft outside and in when moving from one NY lake/river to another! Example: The full-court press to get the water chestnut spread under control. In fact, should you be up in the Albany area this coming week, there’ll be a volunteer water chestnut “pull” Monday and Tuesday at the Five Rivers Environmental Education Center, 56 Game Farm Road in Delmar! And there’re plenty of things we all can do to hold the line in our everyday life… You can even report actual or suspected invasives for investigation… Like sightings of the fumewart (!) now spreading along the Bronx River! Two hundred and twelfth anniversary of the Hamilton-Burr duel on Monday the 11th! Starmaster John Pazmino delves into how directions are defined in the heavens… Then there’s the bonus of stepped outside to take in the July Manhattanhenge! Free! Webster Library Branch, 1465 York Avenue, 3rd Floor, Tuesday-Thursday – 11am-6:30pm, Friday & Saturday, 10am-4:30pm, Saturday the 16th 10am-12pm. Closed on Saturday, July 2nd. It’s Kids’ Day at the Market!! Think story reading, an array of great children’s lit to peruse and a sing-along led by Barefoot Books! Market Manager Guramrit adds to the fun with a kid-friendly cooking demo! And at their tables will be American Seafood, Bread Alone, Ballard’s Honey, Valley Shepherd Creamery, Rising Sun Beef, Alewife, Ole Mother Hubbert, Cherry Lane, Samascott, Gajeski, Green Pastures and Sikking Farms! Basil afficianados… Head for Alewife!! Heirloom tomatoes… Cherry Lane!! Mozzarella… Valley Shepherd!! Last week’s recycling totals: 76 lbs. batteries; 24 lbs. cords, corks, cellphones and cartridges; 6 pairs of eye glasses; 8 compost bins; 42 bags of clothes. Yes, after the holiday weekend, we’re betting there’ll be mountains of compost! And it’s 92nd’s turn for Cooking with Kallos 3.0!! Yup, that Ben Kallos, esteemed Council Member and gourmet cook! He’ll be present, in apron and cooking up a storm from 11am-1pm! Also with us will be American Seafood, Meredith’s Bakery and Bread Alone, Ole Mother Hubbert, Phillips, Norwich Meadows and Stannart Farms! Last week’s recycling totals: 3 lbs. batteries; 2 lbs. cords, corks, cellphones and cartridges; 1 thermometer; 1 3/4 compost bins! For those who’ve had the – we mean it – sublime experience of being out on the East River in one of the Crew’s wonderful boats and want to be – how can you stop yourself – going again and this time bringing friends… For those of you who never been and have been promising yourselves that treat… Give yourself the pleasure of knowing this most green and special pleasure of the UESide’s Esplanade and make sure it continues and expands! Suggested donation, $30. Can the Feds actually be allowing major fracking all over the Gulf of Mexico??? Yes, they are!! Hundreds of them!! And the dumping of billions of gallons of fracking wastewater!! How many folks have inquired about and then complained about the present scant opportunities to recycle unwanted medications… Keep fingers crossed, but it looks like NYState’s heard us! Want to vote for NYC’s worst post office??! If you’ve been thinking our sidewalks are ever more crowded, you couldn’t be more correct!! There’s our state’s also just completed a Bald Eagle Conservation Plan! Another baby possum and even more adorable – is that possible? – than previous ones! Happy 4th of July Weekend, UESiders!! Today’s the 60th B’day of our once great Interstate Highway System. No question 2016 strawberries are fantastic… But this year’s TOMATOES… Holy crow!! Same for Gayeski’s baby basil! And so good to see squash beginning to appear! Really, how unbelievable are Skikking’s flowers…? Last week’s recycling totals: 62 lbs. batteries; 22 lbs. cords, corks, cellphones and cartridges; 9 compost bins; 58 bags of clothes. We chalking up early departures for the holiday weekend for that one less-than-usual bin! Celebrated with the gift of free public access to four of the Society’s primo exhibits featuring sculpture, photographs, video, paintings, ceramics and more! Back and how what with American Seafood, Meredith’s Bakery and Bread Alone, Ole Mother Hubbert, Phillips, Norwich Meadows and Stannart Farms! Last week’s recycling totals: 12 lbs. batteries; 4 lbs. cords, corks, cellphones and cartridges; 4 compost bins and 7160 pounds of paper!! As ever, major thanks to Council Members Kallos and Garodnick for their enduring support AND new sponsor Assembly Member Seawright!! And thank you, Mike and Dolph, for being such great and fun volunteers!! Monday, July 4th: Celebrate July 4th with Alexander Hamilton! Why bother to summarize the multitudinous, amazing, FREE, family-friendly activities… Head directly to the event’s site! Hummm… The U.S. Senate’s moved forward on a bill overturning Vermont’s landmark GMO-labeling law… On the good side of things, both our NY Senators voted against! With the final vote’s set for this coming week, let’s hope food industry slaves get in sync with the public’s will. Where do bits and pieces of the many wonderful NYC buildings betrayed by our Landmarks Commission go? Meanwhile, our mayor’s seen fit to sign Bill 775-A which’ll handily add to the architecture we’ll be losing. San Francisco’ll be banning styrofoam in 2017! As we continue to beat the drum for better care – by us – of our street trees, this particularly fine piece from West Side tree advocate, Melissa Edelstein! That and NYC now has a rooftop vineyard where you can also sample the product! Who knew there was an individual – a French individual – responsible for the proliferation of lilacs…! Ten secrets of the FDNY! Seven “guides to the hidden city” (NYC, of course) recommended by The Times’ Sam Roberts! IKEA’s restyling its blue bag?! Why do our cats like to sleep on our heads…? An heroic mother opossum… And adorable opossum babies! An even more adorable baby koala!! 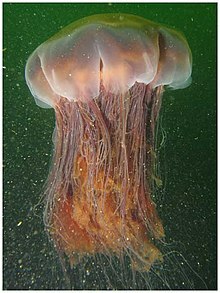 6/23 – New York City: Twice in the last three days a lion’s mane jellyfish was spotted right under Pier 84 at Hudson River Park. Lion’s mane jellyfish have not been seen around as frequently in the past seasons. They come in a variety of colors and are often red or purple. Lion’s mane jellyfish is one of the few planktonic organisms drifting with the tides and currents that is big enough so that we can see with our human eye.